On 10th May, Hapag-Lloyd Cruises new luxury cruise ship, MS EUROPA 2, was officially christened in Hamburg by godmother Dana Schweiger. 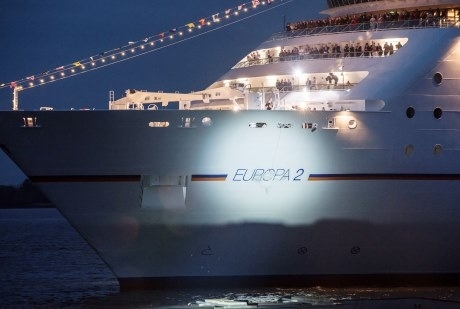 The event took place during the anniversary celebrations of the Hamburg Port at exactly 9.36pm. 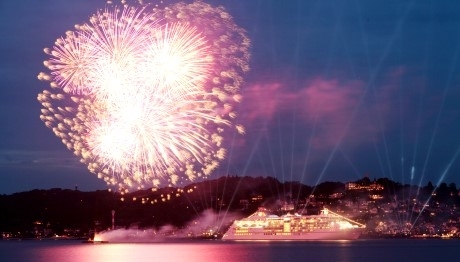 Godmother Dana smashed the champagne bottle against the hull of the ship, officially giving the new ship its name - "I christen you the EUROPA 2 and wish you and your crew good voyages and safe returns, and may there always be enough water beneath your keel,"
After the ceremony, a spectacular fireworks display ended the evening, enjoyed by 700 invited guests. MS EUROPA 2 set sail on her fully-booked maiden voyage that evening, heading to Amsterdam, Antwerp, Honfleur, La Rochelle, Bordeaux, Bilbao, Leixoes and Lisbon. The EUROPA 2 is a modern and casual luxury ship, which does away with cruise traditions such as the captain's dinner. With up to 516 guests, EUROPA 2 provides the greatest space per passenger on a cruise ship anywhere in the world. The ship features exclusively suites with verandas and a minimum area of 28 square metres. Eight restaurants and six bars are dedicated to serving up culinary diversity and a large spa and fitness area accommodates the well-being trend on cruises. Its flexible route concept will appeal to professionals and families in the luxury sector in particular.